From Easter Bunny photo opportunities to Easter egg hunts, here's what's happening in Little Rock and central Arkansas. Kids and bunnies are the cutest combination. Miller, 6, enjoys time with her new fluffy rabbit friends at The Good Earth Garden Center in Little Rock. Special thanks to the landscaping, nursery and garden facility for allowing Little Rock Family to use the grounds for a fun spring photo shoot. Easter is full of bright colors. The spring season brings new growth to the bare trees and brown lawns of winter and families can enjoy nature as flowers bloom and the insects begin to buzz about. During this special time, everyone can get outside and enjoy Easter egg hunts, head to the mall for a picture with the Easter Bunny or remember the reason for the season at a meaningful Easter service. Here’s what’s going on around central Arkansas to help you celebrate the spring holiday. Head to the the mall and hop into spring as you visit the Easter Bunny. You can skip the line by reserving a time online! Click here for the full schedule or call 501-758-6317 for info. FREE! Hop by to see the Easter Bunny! He awaits on the second floor near Dillard’s East. The visits are free, and photo packages are available for purchase. Bunny visiting hours are 10 a.m.-9 p.m. Monday-Saturday and noon-6 p.m. Sundays. Each child who visits the Bunny receives a free coloring sheet and 25 percent off one item at H&M. For info call 501-664-4956. FREE! Celebrate the joys of spring with the whole family. Dress up in your best spring attire to enjoy crafts, interactive activities and an egg hunt. This event will take place in the Darragh Center of the Main Library from 10-11:30 a.m. FREE! Bring a basket to Jacksonville’s largest Easter egg hunt! Toddlers through age 10 participate in this holiday tradition in a fun and safe environment. All participants must arrive by 10 a.m. The Easter bunny will make a special appearance and egg hunts include 2,000 eggs per group! The schedule is: toddlers (field 2) at 10:15 a.m.; ages 4-5 (field 3) at 10:30 a.m., ages 6-7 (field 2) at 10:45 a.m., and ages 8-10 (field 3) at 11 a.m. In case of rain, all ages meet at the Jacksonville Community Center at 10 a.m. For info call 501-982-4171. FREE! Visit with the hoppiest rabbit in town – The Promenade Easter Bunny! Meet at the fireplace next to Bravo Italian from 11 a.m.-2 p.m. on April 13 or 20 and remember to bring a camera for FREE photos with the bunny. Maggie Moo’s Ice Cream & Treatery will be giving the first 100 kids a free gift each Saturday. Pets are also welcome! Call 501-821-5552 for more information. 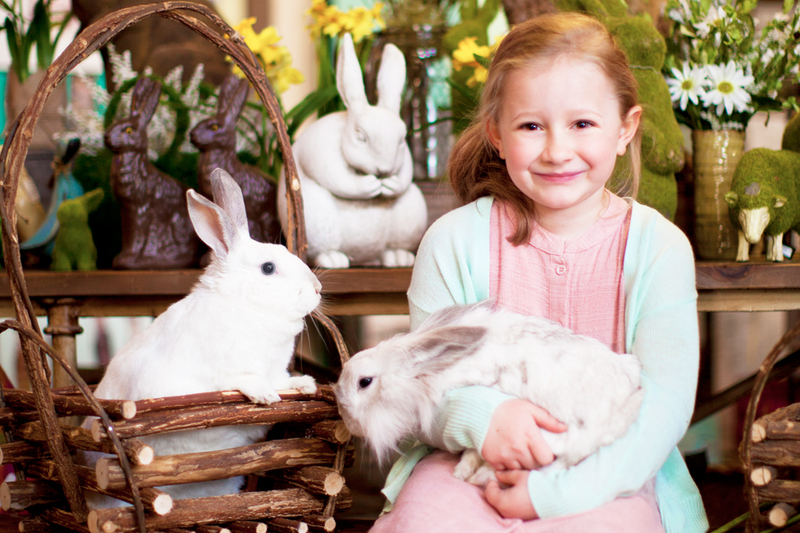 Families are invited to celebrate Easter at Bass Pro Shops by enjoying free photos with the Easter Bunny, crafts for the kids and an old-fashioned Easter egg hunt. Photos take place Saturdays 11 a.m.-6 p.m., Sundays noon-5 p.m., Monday-Thursday 5:30-7:30 p.m. and Fridays 2-8 p.m. Crafts take place Saturdays noon-5 p.m., Sundays noon-4 p.m. and April 19 from 3-7 p.m. The egg hunt kicks off at 2 p.m. on Saturday, April 20 and registration starts at 1:30 p.m. Call 501-954-4500 for more information. FREE! Dive into spring at this unique Easter egg hunt event! Children ages 3-12 are invited to the community center pool to take the plunge for a chance to win toys, Splash Zone passes and more. For registration information, call or visit the website. The hunt goes from 6:30-8:30 p.m. and registration is $5. For info call 501-982-4171. Create bright and colorful eggs at this free crafting event at CALS Main Library. The fun starts at 6:30 p.m. and the activity takes place in Youth Services on the third floor of the Main Library. Call 501-918-3050 for more info. FREE! At the North Little Rock annual Easter egg hunt, kids will hunt for thousands of eggs in groups according to age beginning at 10 a.m. Drawings will be held throughout the morning for door prizes. There will be coloring areas, bounce houses, opportunities to take photos with the Easter Bunny and more! Call 501-906-63003 for more information. FREE! Hop to it! Head to the food pavilion at the Outlets from 11 a.m.-12:30 p.m. for the Easter Bunny Social! Meet and greet with the Easter Bunny and Alice in Wonderland, kids can get their faces painted and more. Call 501-455-9100 for more information. FREE! Join Pulaski Heights United Methodist Church for family fun and an egg hunt for children in fifth grade and under. 10:30 a.m. is the Kindersongs Concert and the hunt starts at 11 a.m. For info call 501-664-3600. FREE! Join New Life Church for family fun and an egg hunt! The fun starts at 2 p.m. at the greater Little Rock campus and at 5:30 p.m. at the downtown Little Rock campus. FREE! A free Easter egg hunt with plenty of fun including bounce houses, face painting, a photo booth, door prizes and more! The fun goes from noon-2 p.m. The event is free, but RSVP so that there is sure to be enough food to go around. Call 501-372-2256 for more information. FREE! A free Easter egg hunt with a chance to win prizes and visit with the Easter bunny! There will be free hot dogs, chips and drinks and a family photo booth. Goes from 10 a.m.-1 p.m. For info call 501-217-6700. FREE! A free Easter egg hunt for ages 10 and under. The fun starts at 9 a.m. sharp; don't be late or the eggs will be gone! Have a chance to win prizes, take pictures with the Easter Bunny and more. In case of rain, the event will take place in the Jess Odom Community Center. For more info call 501-851-6990. FREE! Kids will run in a 22-obstacle fun run collecting Easter eggs along the way. At the end of the course kids will receive a medal and turn their eggs in for big candy! After the obstacle run, take photos with the Easter bunny, enjoy lunch from food trucks, play in bounce houses and more! Races for each age group will run once every hour from 1-4 p.m. Call 501-663-5232 for more information. FREE! Celebrate spring and the great outdoors at Great Escape Weekend! Enjoy free nature-related and family-oriented activities. The celebration will conclude with an Easter egg scramble for about 2,000 eggs. Contact the park for a complete schedule; activities take place 2-4 p.m. each day. For info: 501-727-5441. FREE! For more than 30 years, Lake Catherine State Park has hosted an Easter egg hunt. The hunt is for children 12 and younger. Meet at the Picnic Hill area. The action begins promptly at 2 p.m. For info call 501-844-4176. FREE! Celebrate Easter in downtown Little Rock as thousands gather on the banks of the Arkansas River with music, scripture and fellowship. This is a non-denominational service for all ages. The dress is casual and attendees are encouraged to bring lawn chairs. Leashed dogs are welcome. 7 a.m. For info call 501-664-3600. FREE!